I’m not seeing many Red-Spotted Purples here in Georgia, but in early summer they were very, very common back in Pennsylvania. I loved them, and played a little game with myself, challenging JLZ to find an individual with very prominent red spots at the margins of those forewings. I like them. For 2 decades, they would appear on the trails that I worked, we repeating over and over again the routine: I approach on the trail, they fly up no more than 2 feet up, to a new spot 12 feet up trail. I continue my hiking, reach them, and again they fly up a bit, and take a new spot, again some 12 feet up trail. Trail companions they were, reminding me of my trusty black Russia pup, Petra. 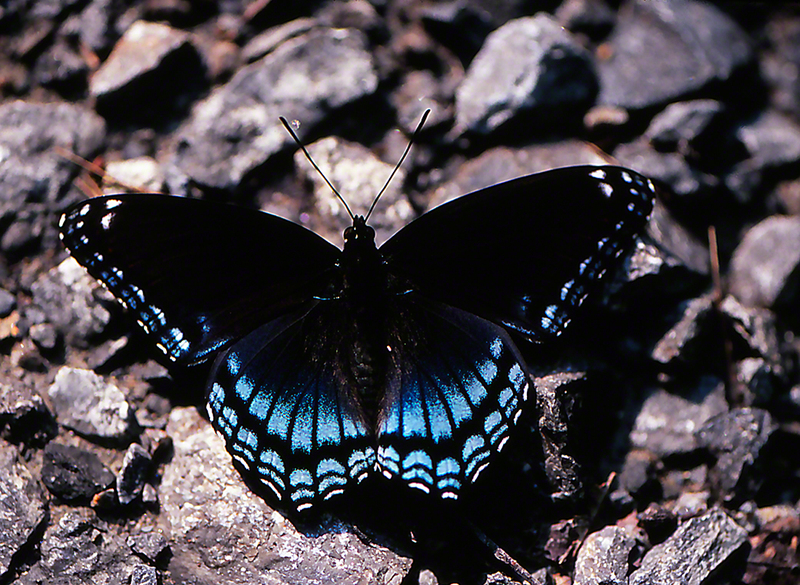 Find a stunner of a Red-Spotted Purple, and you wonder to yourself, Why do some of us search the wilds of Brazil, India, Bolivia or Myanmar, when here in the USA, you may find a Red-Spotted that equals any of the rare stunners in any corner of the world. They remain, my vote for the No Respect Butterfly, seen as we sail down trails, but infrequently offered the respect and attention they richly deserve.